Continuing international demands for an Israeli withdrawal from every square metre of the territory occupied by Israel in the Six Day War - now misleadingly termed ”The occupied Palestinian Territories ” (OPT) in countless UN General Assembly and Security Council resolutions - acquires particular resonance on the 46th anniversary of the outbreak of that War on 5 June. This territory - in which 500000 Jews now live - had not one Jew or Jewish settlement located within it between 1948 - 1967. Transjordan had occupied the West Bank and East Jerusalem whilst Egypt had occupied Gaza after their invasion of Palestine along with five other Arab armies in May 1948. Jews then living there had been driven out whilst Jews generally were denied their legal entitlement to “close settlement” on that land including State lands and waste lands not required for public purposes - as prescribed by article 6 of the Mandate for Palestine and article 80 of the UN Charter. Nineteen years was surely long enough for a Palestinian Arab state to have been created in this Jew-free territory- the identical area of land that PLO Chairman Mahmoud Abbas and the Arab League now consider to again be made Jew free to end the Arab-Jewish conflict. After all - with all the Jews gone and their legal right to live there eliminated by the power of the gun - it would have been very easy to declare a Palestinian Arab State there - seek membership in the UN and its agencies - and live happily ever after in peace with the Jewish state. 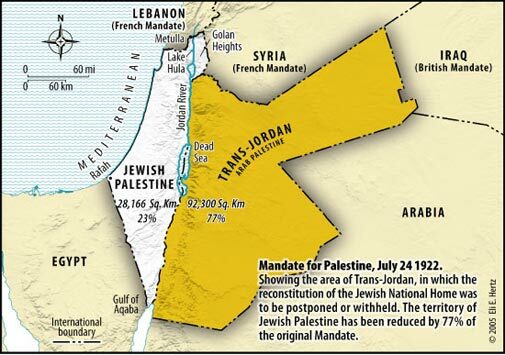 Instead the Arab residents of the West Bank and East Jerusalem voluntarily chose to unify these territories in 1950 with Transjordan to form a new territorial entity renamed Jordan. In 1964 demands by the Palestinian Arabs to rid former Palestine of any Jewish presence became entrenched in the Charter of the PLO. What is now deemed so essential for peace in 2013 - the so called “two-state solution” was never even contemplated in 1964 - when it could have been created with the stroke of an Arab League pen within the next three years. Instead the Arab states placed their support behind the newly constituted PLO and its proclaimed aim to wipe Israel off the map. Promises of yet another 1948 style Arab invasion to wipe out the Jewish State were threatened - at a time when Jews and Jewish settlement in the West Bank, East Jerusalem and Gaza were not an “obstacle to peace” - since no Jews lived there. “The Zionist barrack in Palestine is about to collapse and be destroyed. Every one of the hundred million Arabs has been living for the past nineteen years on one hope – to live to see the day Israel is liquidated…There is no life, no peace nor hope for the gangs of Zionism to remain in the occupied land ….The sole method we shall apply against Israel is a total war which will result in the extermination of Zionist existence”. The rest is history - yet the world currently suffers from memory deficit in failing to understand that what was possible between 1948-1967 cannot be achieved in 2013.